The long, coiled arms of a spiral galaxy can be seen in rich detail in a new photo from the European Southern Observatory. The European Southern Observatory's (ESO) Very Large Telescope zoomed in on the galaxy and its most distinctive features: its long spiral arms that are dotted with bustling star-forming regions, interspersed with veins of dust. In this new image, the galaxy's colorful yet seemingly blurry spiral arms can be seen. Older stars dominate the reddish area in the center while young, hot blue stars permeate the arms further away from the core. The Very Large Telescope is located at the ESO's Paranal Observatory in Chile. The arms of NGC 3521 are somewhat patchy and irregular, which makes it a so-called flocculent spiral galaxy, astronomers said. These galaxies exhibit "fluffy" spiral arms that differ from the sweeping arms of grand-design spiral arms, such as can be seen in the famous Whirlpool galaxy or M 51, which was discovered by the French astronomer Charles Messier. The bright NGC galaxy is relatively close (in astronomical terms). It can easily be spotted by skywatchers equipped with a small telescope, such as the one used by Messier when he catalogued a series of hazy and comet-like objects in the 1700s, ESO officials said. 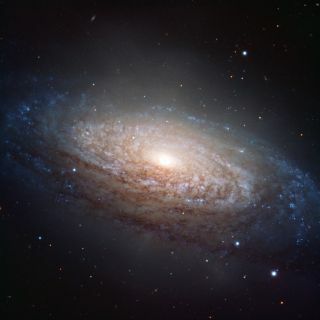 NGC 3521 was discovered by another famous astronomer, William Herschel, in 1784, the year that Messier published the final version of his catalogue. Herschel spotted NGC 3521 early on in his more detailed surveys of the northern skies, according to ESO officials. Using his larger, 47-cm (18.5-inch) aperture, telescope, Herschel spotted a "bright center surrounded by nebulosity," he recorded in his observation notes. While Messier was the first to catalog these objects, he may have overlooked the fluffy NGC 3521 spiral, even though he identified several other galaxies of similar brightness in the constellation of Leo. Data used to construct this new image were selected by Oleg Maliy, who participated in ESO's Hidden Treasures 2010 astrophotography competition. The contest invited amateur astronomers to sift through ESO's vast archives to transform raw, gray-scale telescope observations into stunning full-color images of space.